Now here’s a refreshing new take on Dollhouses. 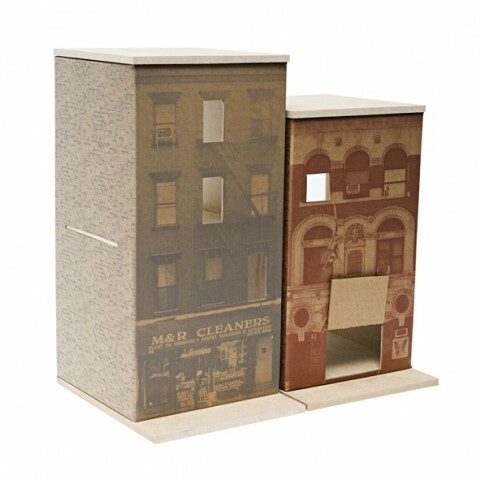 Our children’s gorilla created this simple cardboard building with urban fronts for your playing city-minded child. I like it! They’re not exactly dollhouses, but you sure should check the ‘Dominion’ cardboard buildings Seth makes. My good friend Ron Ribant started making cardboard structures that reflected his neighborhood in Philly a couple of years ago. Take a look: http://www.etsy.com/shop/daymaker. Unique idea for a dollhouse..it’s cool how it strays away from traditional. Great to use for decorating!